All over Biafraland, and among Biafrans in the diaspora, the paramount issue is how to extricate ourselves, our land (Biafra), from the accursed and expired contraption called Nigeria. The restoration of Biafra as a sovereign and independent State is the one and only (major) agenda of Biafrans; we are determined about it. As usual, Nigeria "leaders," whom have incurred mendacity and deception from the British colonialists, have been working round the clock, in a bid to hamper the quest for the restoration of the sovereignty of Biafra through political machinations. More often than not, it works for them, against gullible Biafrans that buy into their lies and deceits and then use them against their people’s true agenda. With this, they have been able to impede and muddle-up the primary agenda of the Biafran people. However, that was then. Times are different. The people have aligned themselves under one umbrella, the Indigenous People of Biafra (IPOB). These machinations (Igbo presidency, construction of the Second Niger bridge, et al) outright, are the recurrence of past administrations. One would ask, was the Igbo presidency not proposed for 2019? Why all of a sudden it is now 2023? 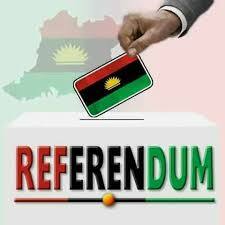 Many politicians of Igbo extraction have been sold to this idea, "Igbo presidency," and they have been using it to work against the unassailable quest of the Biafran people, which is referendum for independence. It is pertinent to note that in the past, they successfully used it to lure uninformed and unsuspecting Biafrans away from their true agenda. Too bad for them. However, this dispensation of Biafrans are wiser, through the unalloyed information and education from the leadership of IPOB and its iconic institution, Radio Biafra and Biafra Television. We now understand their ploys even before they are hatched. How about the second Niger bridge, which was the superlative agendum in Buhari's manifesto during the 2015 electioneering campaign? The bridge in question was engineered to be completed before this time; spanning River Niger, linking Onitsha and Asaba - Biafraland. At this point, however, it is blatant that all these are "pawns" orchestrated to usurping the political mandates of the Biafran people each election year. Nevertheless, the knowing Biafrans are already telling Buhari and his cohorts to forget about any plans of building such phoney bridge. Arguably, we Biafrans have better competences to setting up our structures more than Nigeria, and as such would want to build the bridge(s) ourselves; following our exit from the enclave, Nigeria. Therefore, the quest for Biafra restoration remains unalterable, and per se unequalled to Igbo presidency or Second Niger bridge.